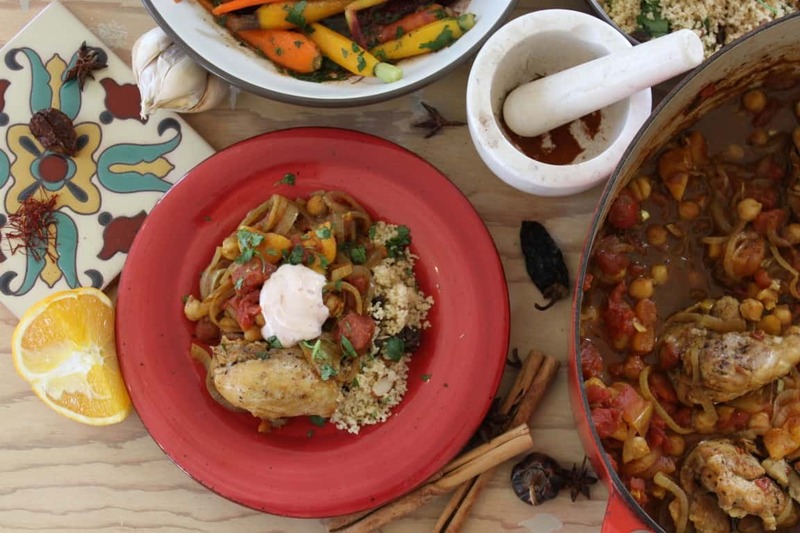 I was so excited when I first found this Bobby Flay recipe for Moroccan Chicken, Apricot and Chickpea Tagine. However, the fat, calories, and time it took to cook made it a rare weekend treat. Over time, I’ve tweaked the recipe so that it’s now healthy and fast enough to whip up after work while just as flavorful. It’s a favorite on our regular rotation and makes fantastic leftovers since the flavors only seem to deepen as they blend. Ras el Hanout, loosely translated to “top of the shop” is a Moroccan spice blend. Harissa is a North African chili paste. You can find them at specialty stores, order them from Amazon like I do, or make them yourself. 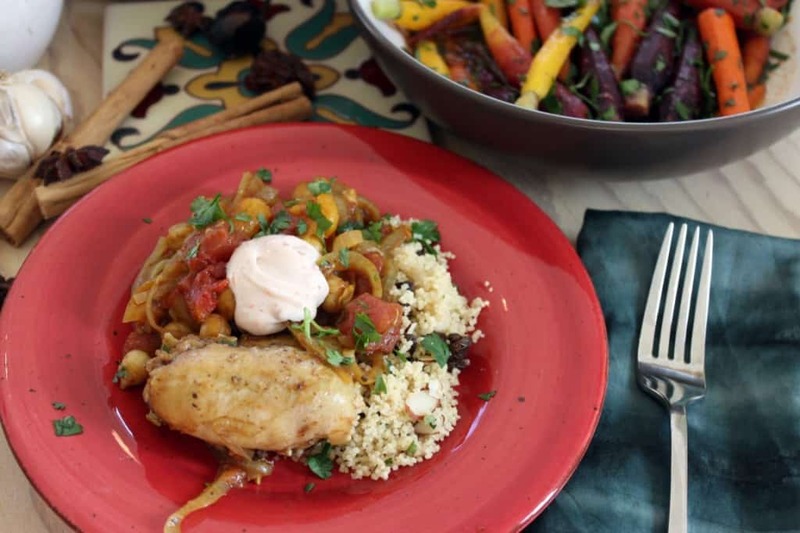 Serve with a side of cous cous mixed with raisins, almonds and parsley or with Moroccan Spice Marinated Carrots for a healthy, gluten-free meal. Soak saffron and cinnamon stick in chicken broth and set aside. Mix sour cream with harissa paste and refrigerate. Heat 1 tsp olive oil in a large Dutch oven over medium high heat. Season chicken with salt and pepper and cook until golden brown. Remove chicken to a plate. Add remaining 2 tsp olive oil and reduce heat to medium. Add the onions and cook, stirring, until translucent. Add the garlic and cook for 30 seconds. Add the Ras el Hanout and cook another 30 seconds. Add the saffron with the soaking liquid, cinnamon stick, tomatoes, chickpeas, and apricots and bring to a simmer. Nestle the chicken into the mixture and bring to a simmer. Cover and cook in the oven for 20-25 minutes. Garnish each serving with a dollop of harissa sour cream, parsley and cilantro.